This entry was posted in Healthy Conversions by Dr. Ochner. Bookmark the permalink. Yum! I will be trying this.Thanks. That would be awesome! Thanks for another great post! that’s such a great idea! Thanks for the tips ! Man I miss big macs haha, 4 weeks into my cut. Healthy big mac this is great. wow, I watched this now Im hungry !, brb kitchen ! I don’t eat any animal products. but this one still made me hungry. 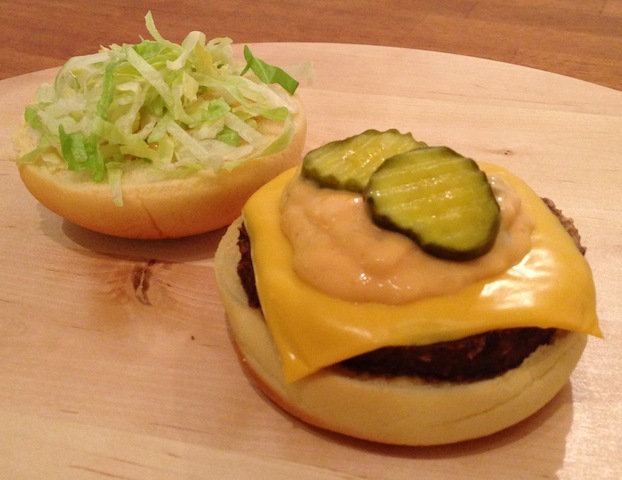 Believe it or not, it’s actually a Boca (soy) burger- no meat but you can barely tell the difference! This looks absolutely delicious! Yum! Have a great day ! This looks absolutely delicious! Yum! Have a great weekend ! I love big macs and whoppers! I haven’t eaten them in a while but think this is delicious ! Great! introduce health problems to those who probably didnt need it ! Does it really taste like a real Big Mac ? It tastes SHOCKINGLY like a real big mac. In my mind, it actually tastes better b/c I can throw on a few extra pickles and little more special sauce, AND I know it’s super healthy so I enjoy eating it much more than the original. Not only guilt-free but I’m proud of myself for eating it, knowing I’m doing something good for my body! I love Big Mac. I’m gonna try this recipe. I use soy cheese instead, because I find it has more flavor than fat free cheese. I also prefer light eggless canola mayo/spread. These are great alternatives for vegans.